The Chief Electoral officer (CEO) Telangana has Providing online Services for Citizens. They can Provide all Voter Card related Services like E-Registration, New Voter ID Card Registration ( Form-6 ), Objections to inclusion of name ( Form -7 ) , Voter id Card Correction ( Form - 8 ), Voter ID Card Transfer ( Form - 8A ), Voter ID Status, Assembly Constituency / Council Constituency Voter Car list all Services is necessary for Citizens. People Can Easily enrol their name in Electoral Rolls, through this portal. The Voter ID card is an identity document issued by the Election Commission of India. which primarily serves as an identity proof for Indian citizens while casting votes in the country's municipal, state, and national elections.It also serves as general identity, address, and age proof for other purposes. 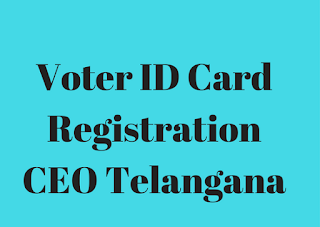 The Chief Electoral officer (CEO) Telangana has given opportunity for Citizens, Can Register their Voter ID Card through Department official website http://ceotelangana.nic.in/ , Follow the below instructions for apply Voter ID Card online. How to apply Telangana Voter ID Card online ? Log on to http://ceotelangana.nic.in/# or Click here for form-6 ( New Voter Enrollment Form ). Than redirect New web page,You'll see E-REGISTRATION (Form-6) online application form, you need to fill Complete application form, fill all necessary details. Upload Your Recent Passport Size Photo (240x320 and not more than 100KB, Before processing Keep Scanned Photo Copy ). Fill your Personal Details as ( Full Name, Father Name, Full Address with Pin code, District, Mobile Number) after Completing All details. If you find Every thing OK Than click on ''Submit" Button. Finally your Acknowledgement and Application number will be generate, than Take Print out for future Reference. 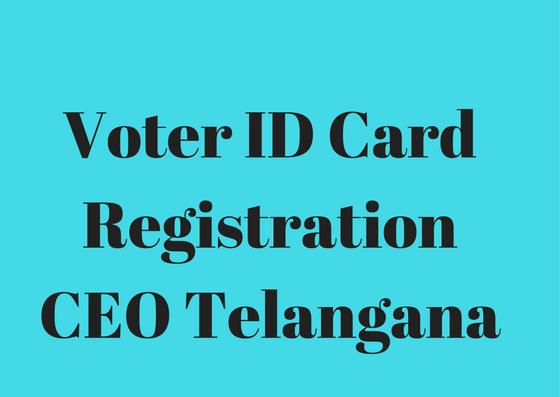 How to Check Telangana Voter ID Card application Status online ? Finally Get Voter ID Card application Status online. How to Search name in Telangana Electoral Roll ? Finally Click on 'Search' Button.